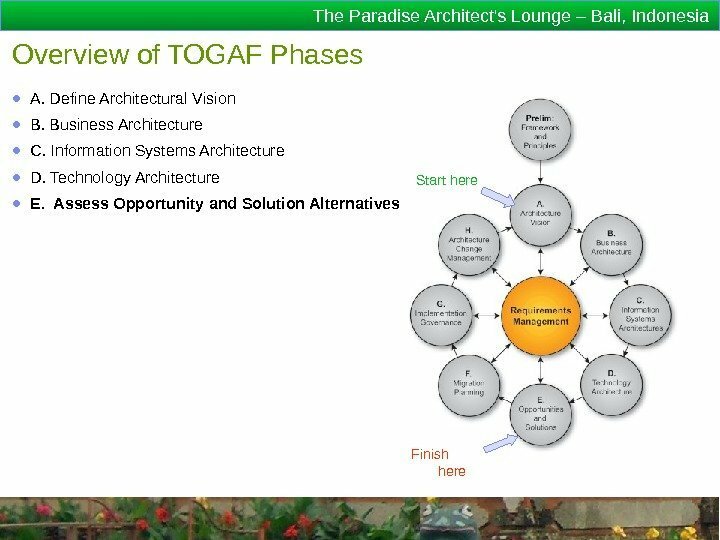 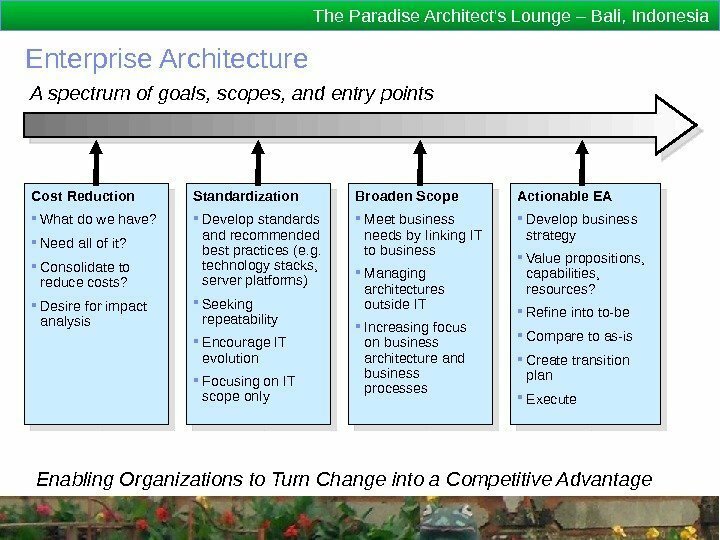 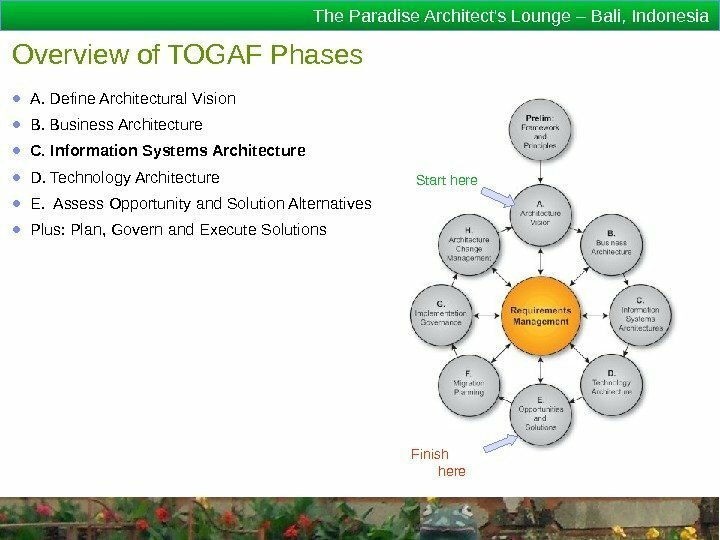 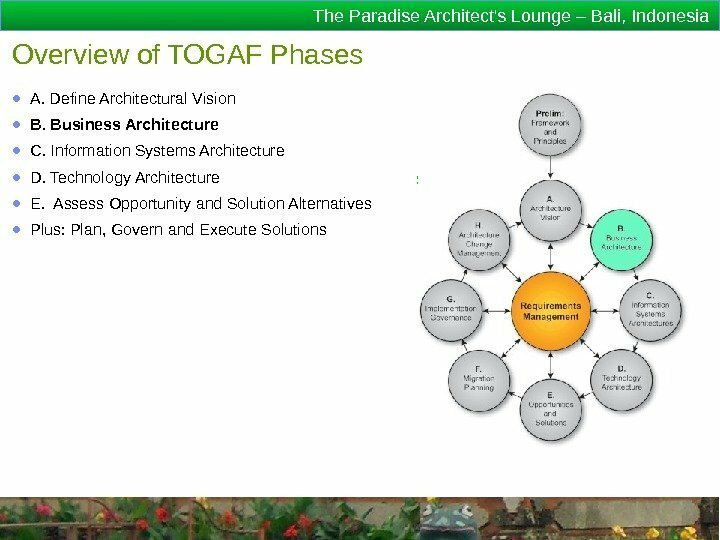 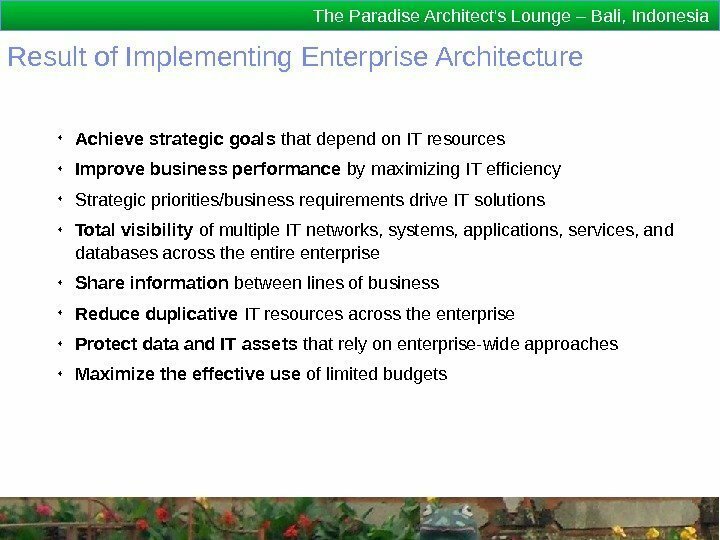 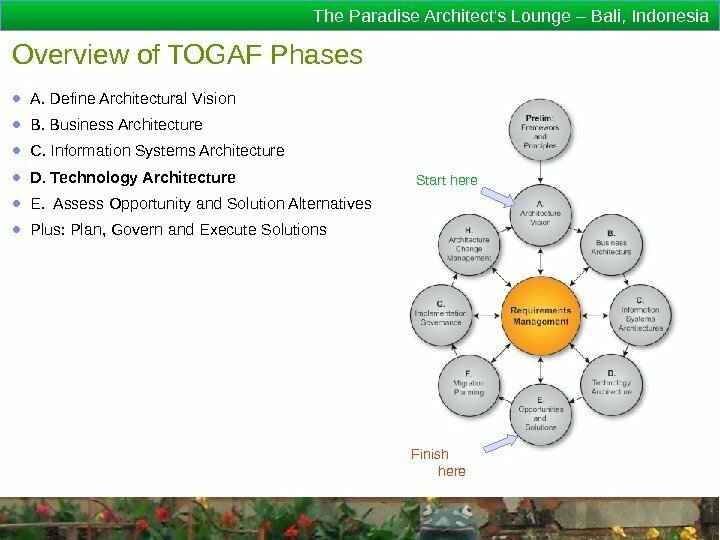 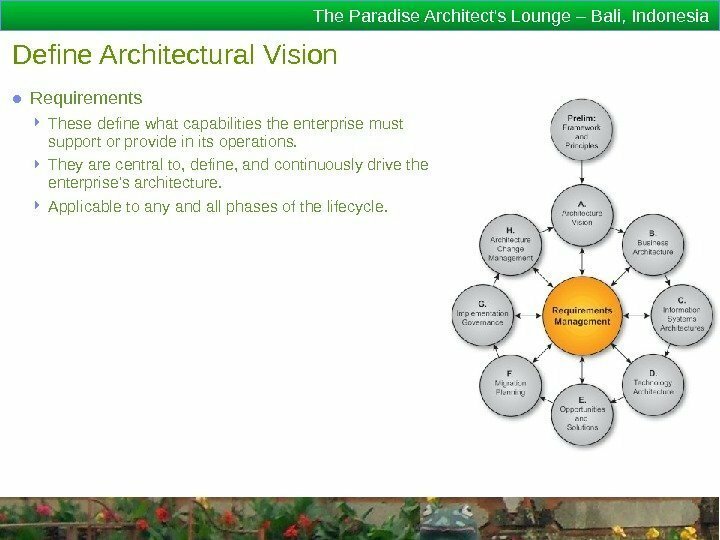 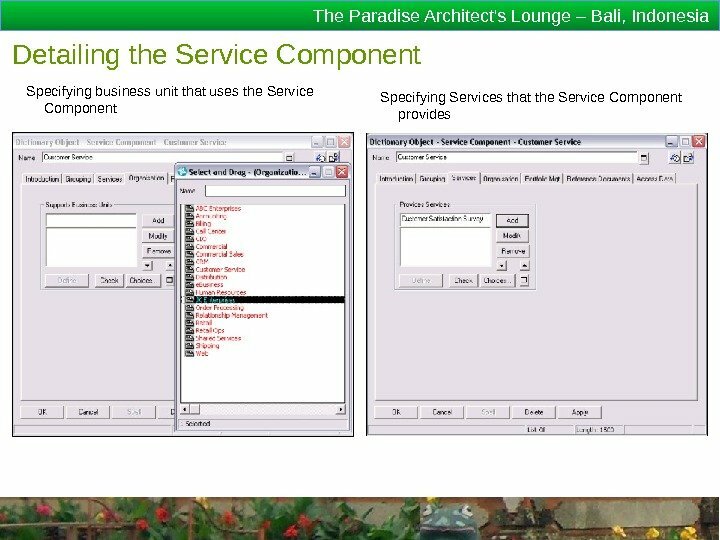 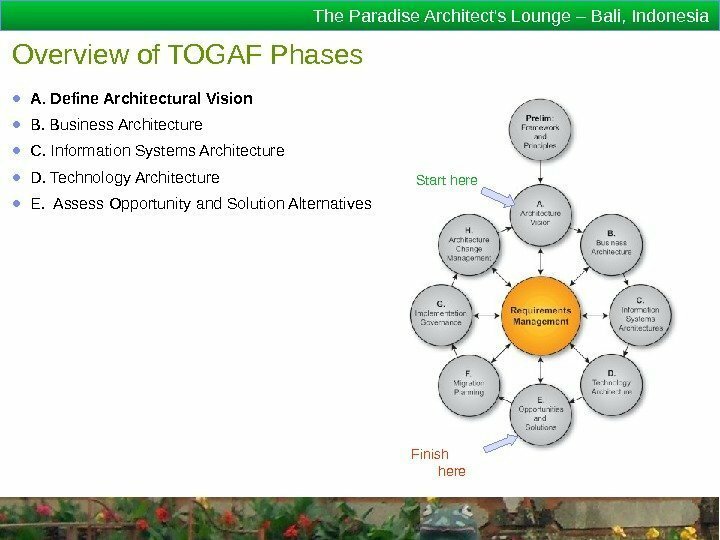 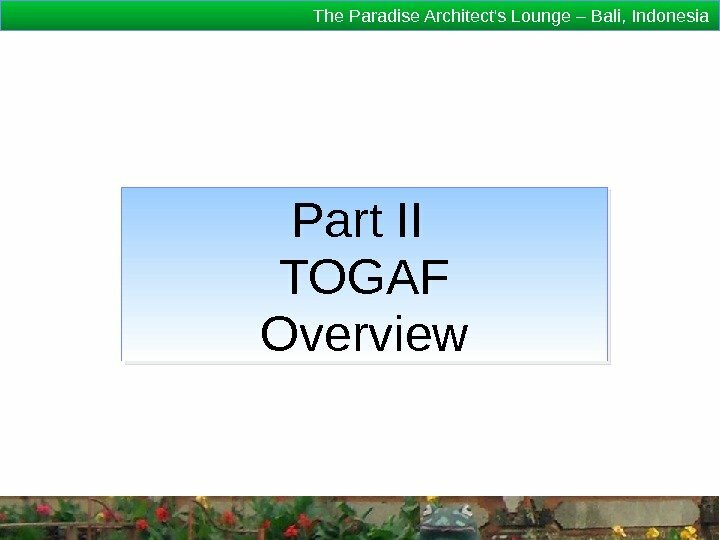 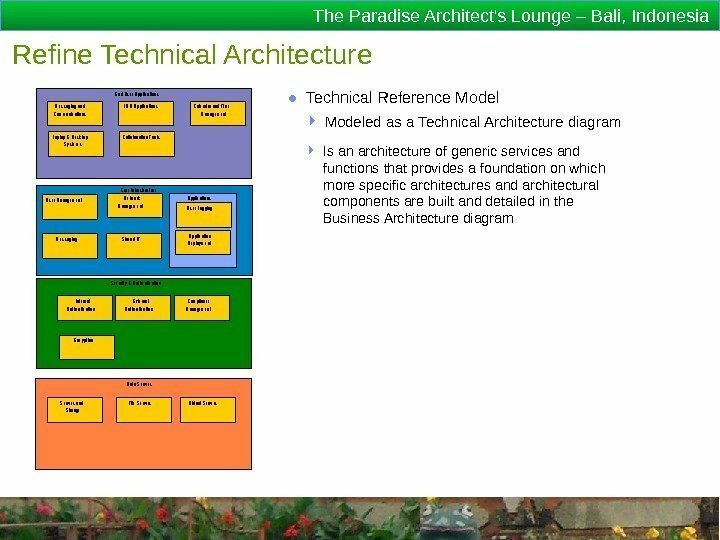 The Paradise Architect’s Lounge – Bali, Indonesia Definition of TOGAF ● The Open Group Architecture Framework (TOGAF) is a framework and detailed method for building, maintaining, and gaining value from an enterprise architecture for an organization. 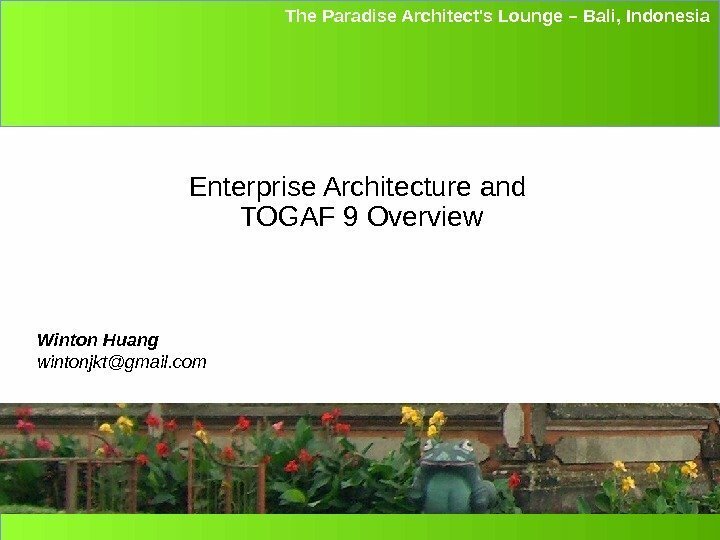 ● TOGAF 9 is the latest evolution of the framework, and its accompanying Architecture Development Method (ADM) ● The TOGAF specification is an open standard that has been created and is maintained by The Open Group (www. 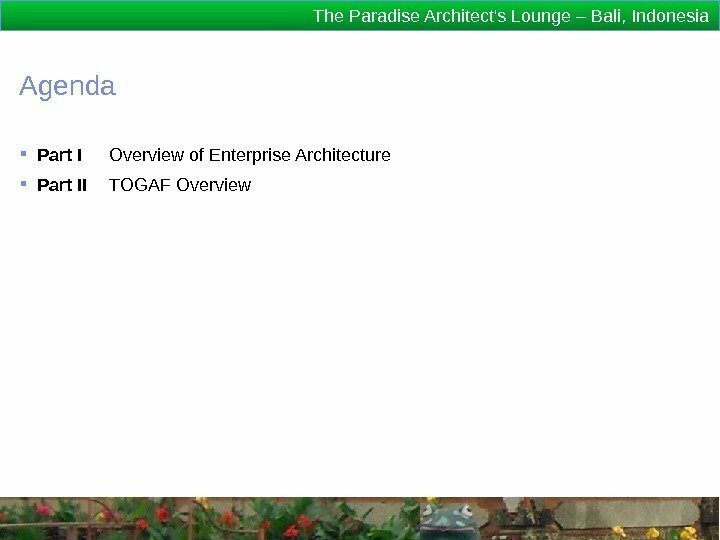 opengroup. 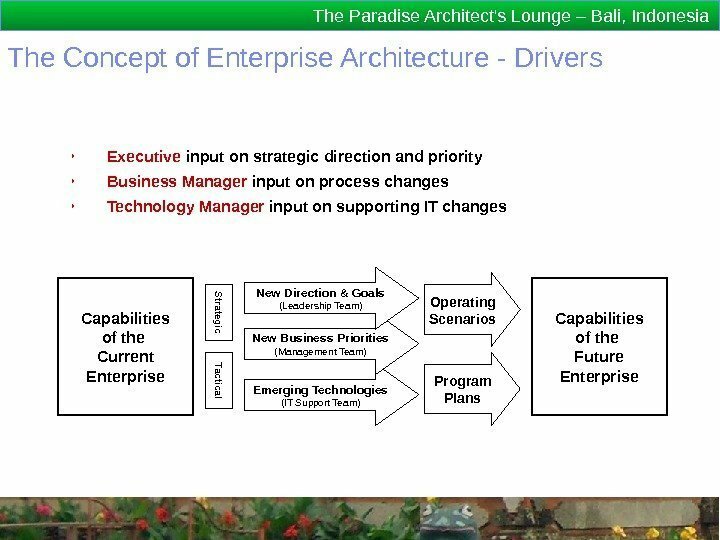 org). 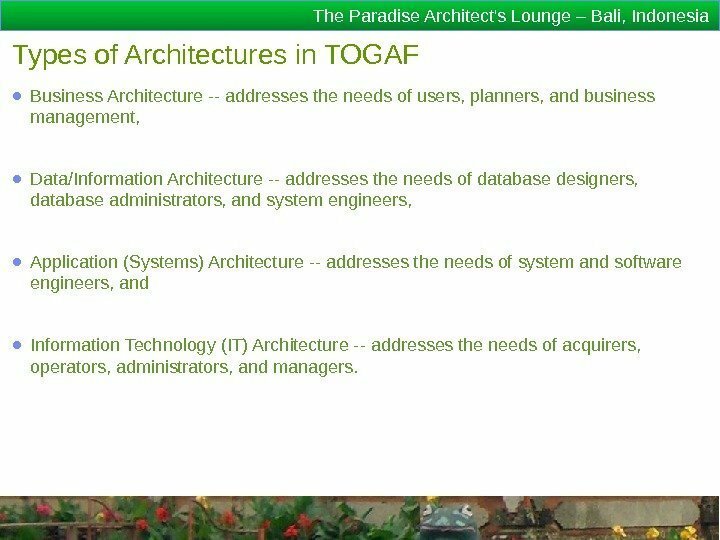 The Paradise Architect’s Lounge – Bali, Indonesia Types of Architectures in TOGAF ● Business Architecture — addresses the needs of users, planners, and business management, ● Data/Information Architecture — addresses the needs of database designers, database administrators, and system engineers, ● Application (Systems) Architecture — addresses the needs of system and software engineers, and ● Information Technology (IT) Architecture — addresses the needs of acquirers, operators, administrators, and managers. 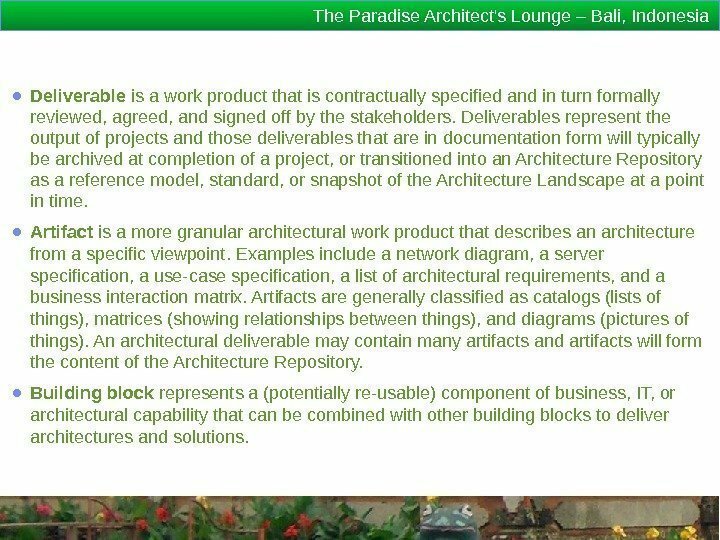 The Paradise Architect’s Lounge – Bali, Indonesia ● Deliverable is a work product that is contractually specified and in turn formally reviewed, agreed, and signed off by the stakeholders. 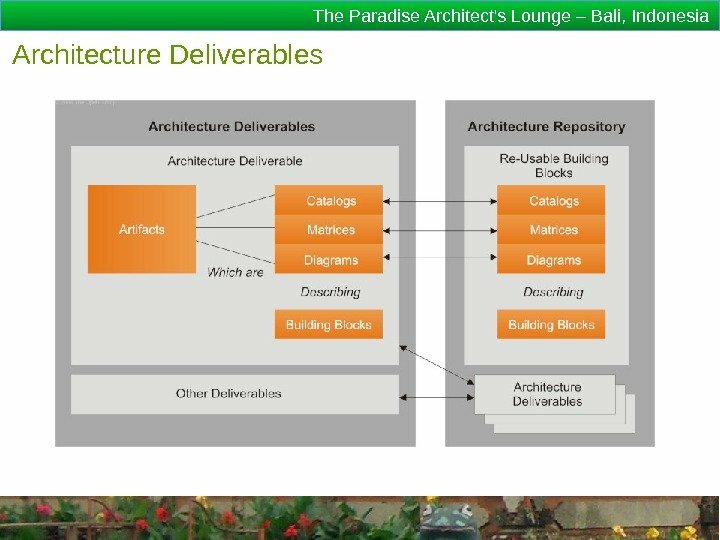 Deliverables represent the output of projects and those deliverables that are in documentation form will typically be archived at completion of a project, or transitioned into an Architecture Repository as a reference model, standard, or snapshot of the Architecture Landscape at a point in time. 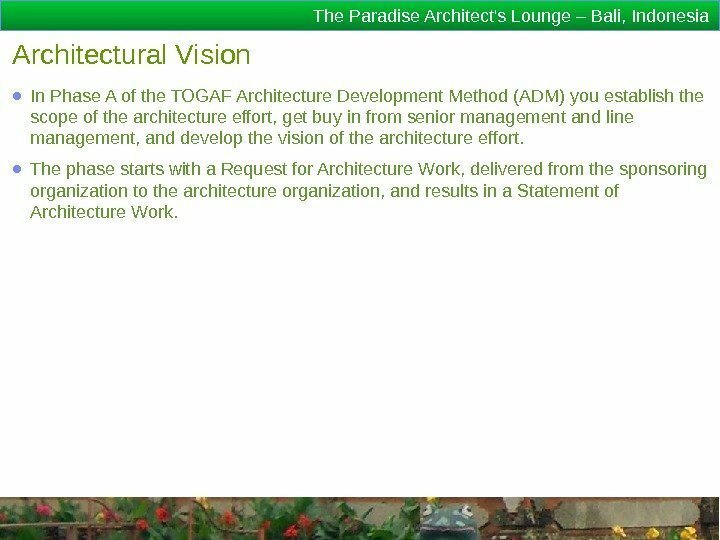 ● Artifact is a more granular architectural work product that describes an architecture from a specific viewpoint. 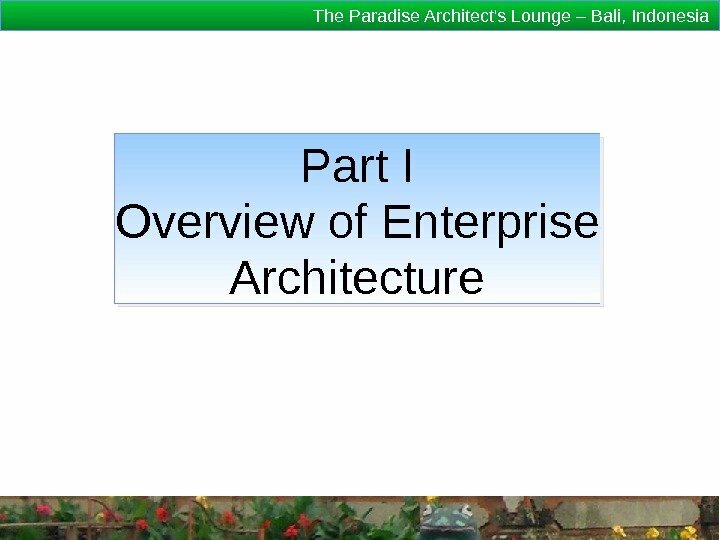 Examples include a network diagram, a server specification, a use-case specification, a list of architectural requirements, and a business interaction matrix. 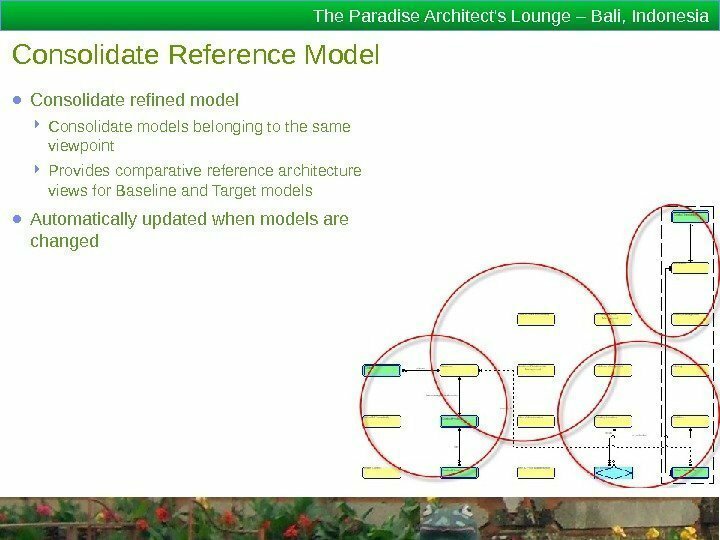 Artifacts are generally classified as catalogs (lists of things), matrices (showing relationships between things), and diagrams (pictures of things). 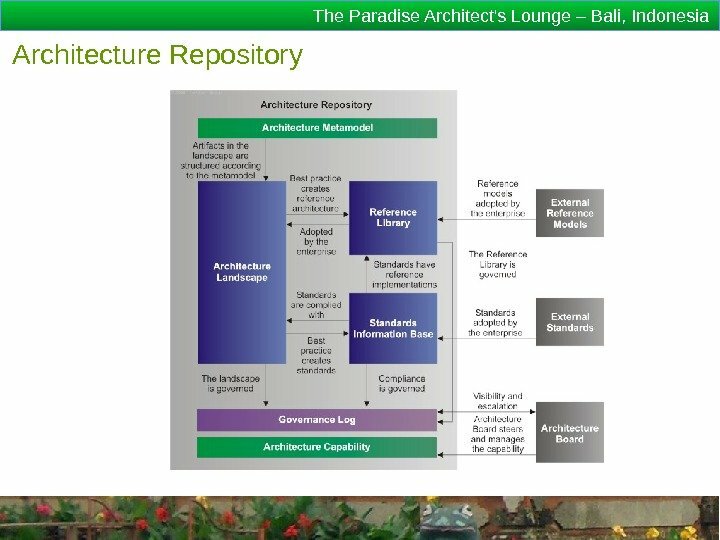 An architectural deliverable may contain many artifacts and artifacts will form the content of the Architecture Repository. 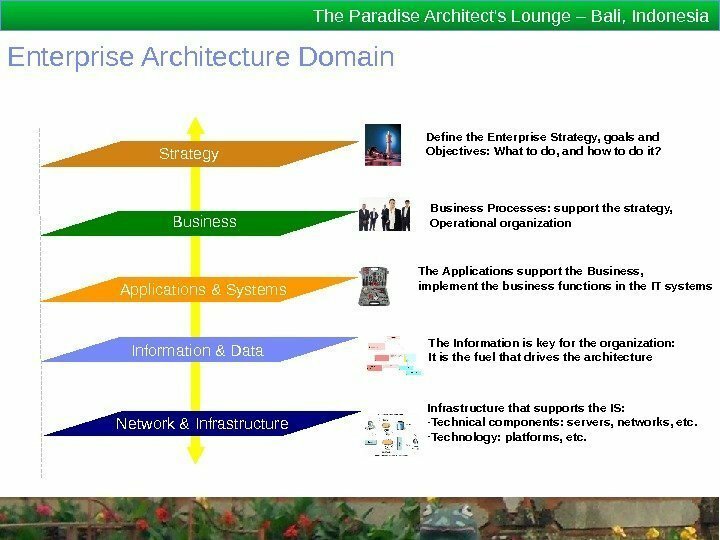 ● Building block represents a (potentially re-usable) component of business, IT, or architectural capability that can be combined with other building blocks to deliver architectures and solutions. 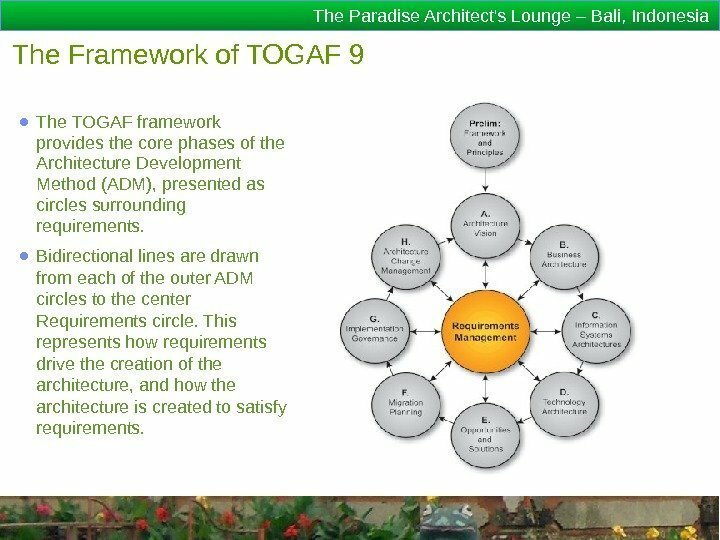 The Paradise Architect’s Lounge – Bali, Indonesia The Framework of TOGAF 9 ● The TOGAF framework provides the core phases of the Architecture Development Method (ADM), presented as circles surrounding requirements. 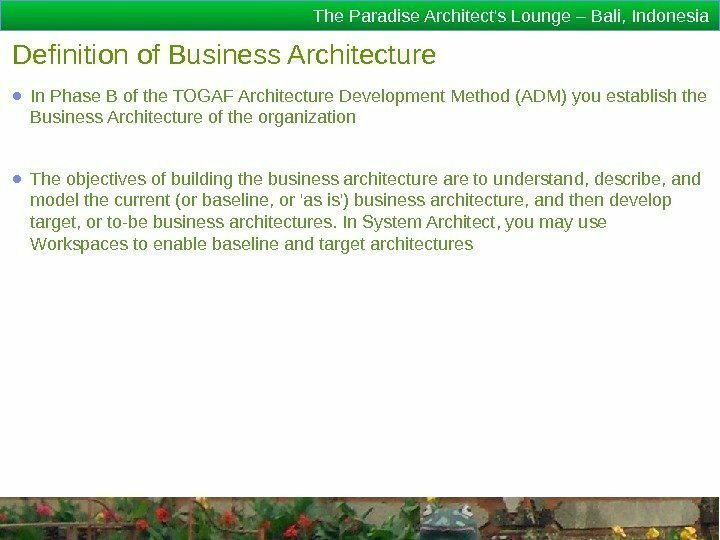 ● Bidirectional lines are drawn from each of the outer ADM circles to the center Requirements circle. 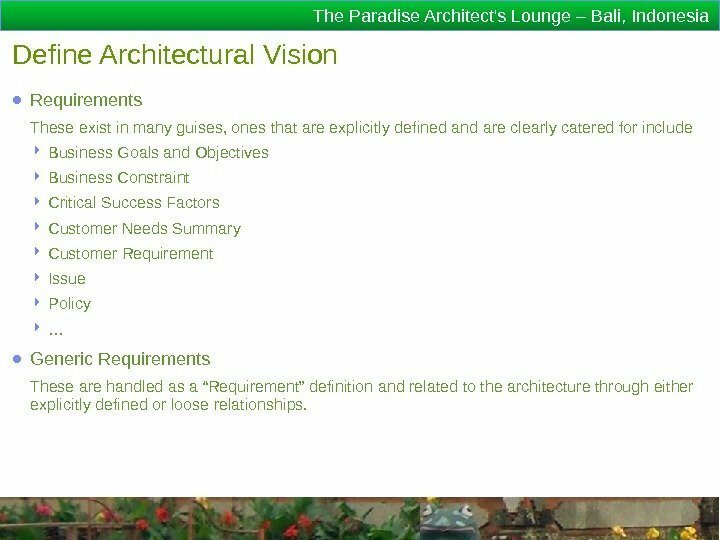 This represents how requirements drive the creation of the architecture, and how the architecture is created to satisfy requirements. 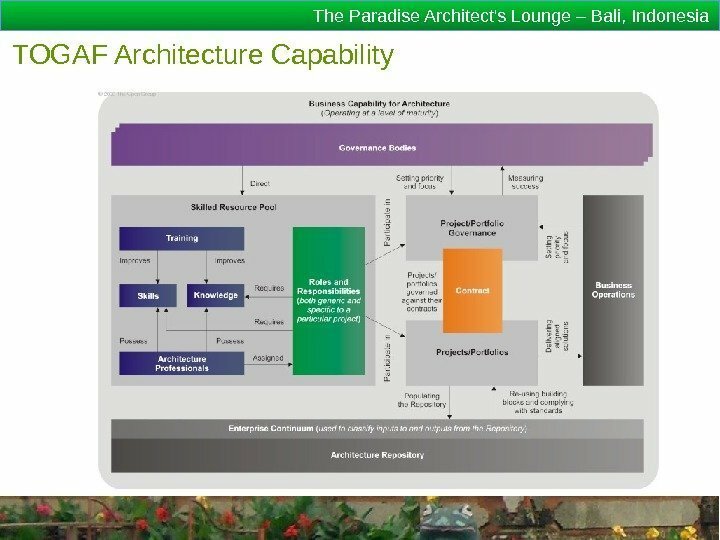 The Paradise Architect’s Lounge – Bali, Indonesia Architectural Vision ● In Phase A of the TOGAF Architecture Development Method (ADM) you establish the scope of the architecture effort, get buy in from senior management and line management, and develop the vision of the architecture effort. 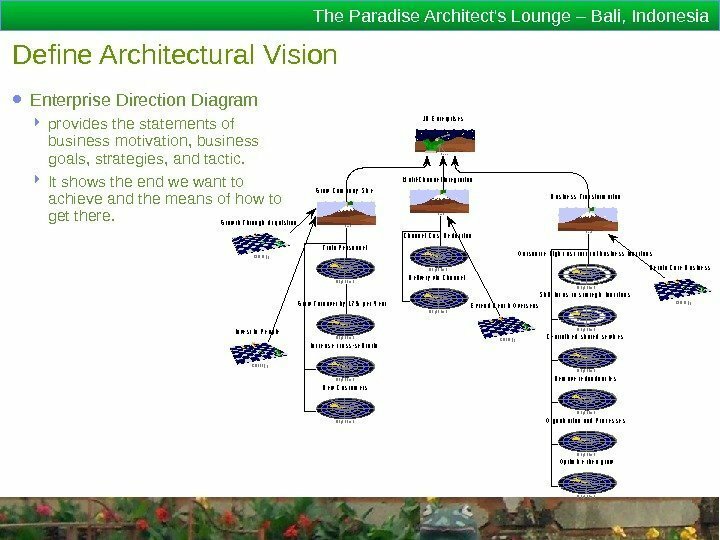 ● The phase starts with a Request for Architecture Work, delivered from the sponsoring organization to the architecture organization, and results in a Statement of Architecture Work. 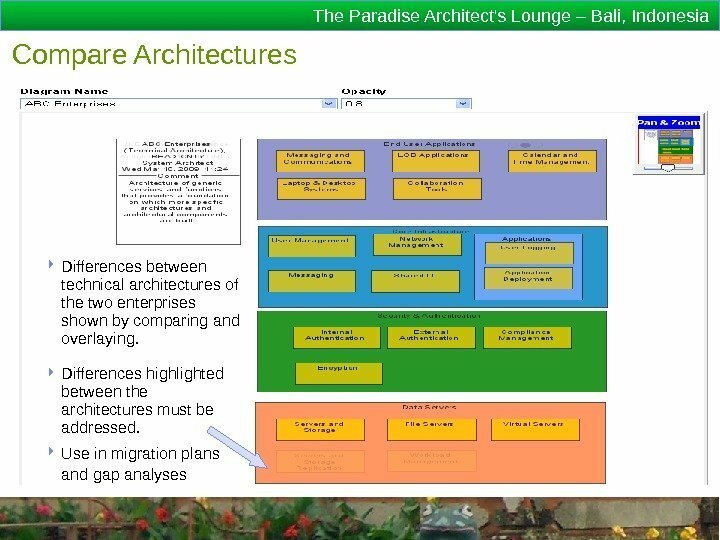 The Paradise Architect’s Lounge – Bali, Indonesia Define Architectural Vision ● Requirements These exist in many guises, ones that are explicitly defined and are clearly catered for include Business Goals and Objectives Business Constraint Critical Success Factors Customer Needs Summary Customer Requirement Issue Policy … ● Generic Requirements These are handled as a “Requirement” definition and related to the architecture through either explicitly defined or loose relationships. 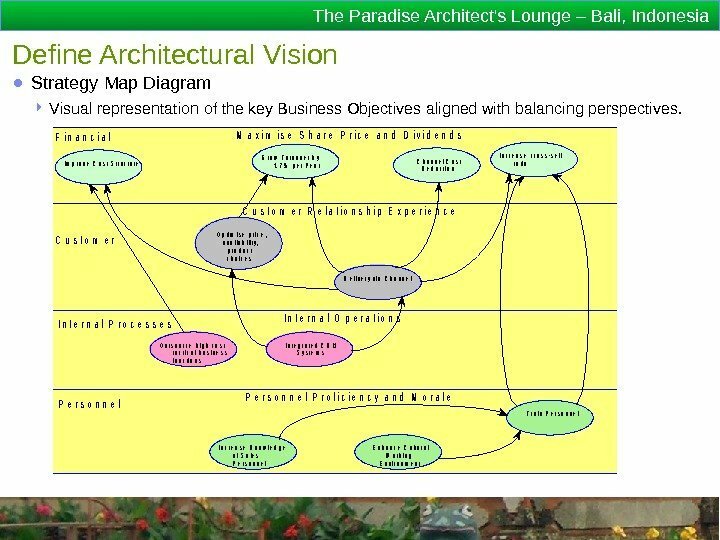 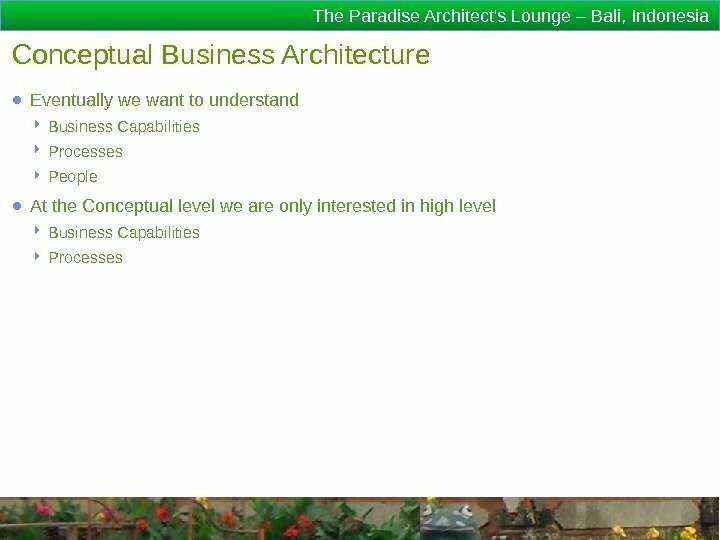 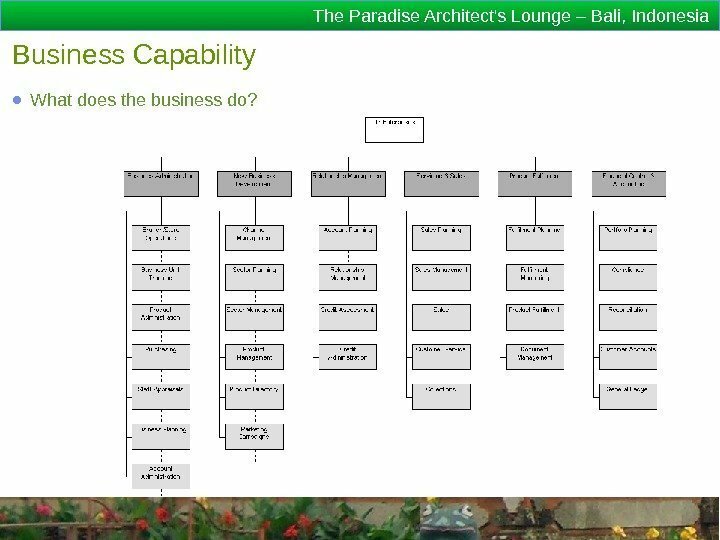 The Paradise Architect’s Lounge – Bali, Indonesia Business Capability ● What does the business do? 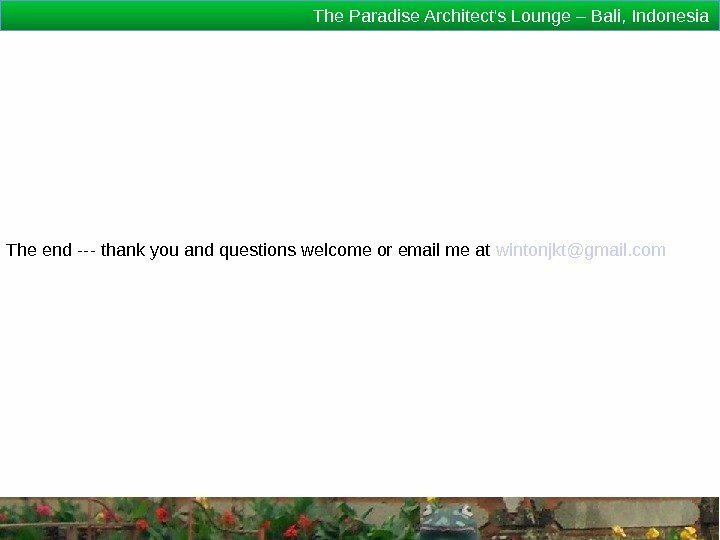 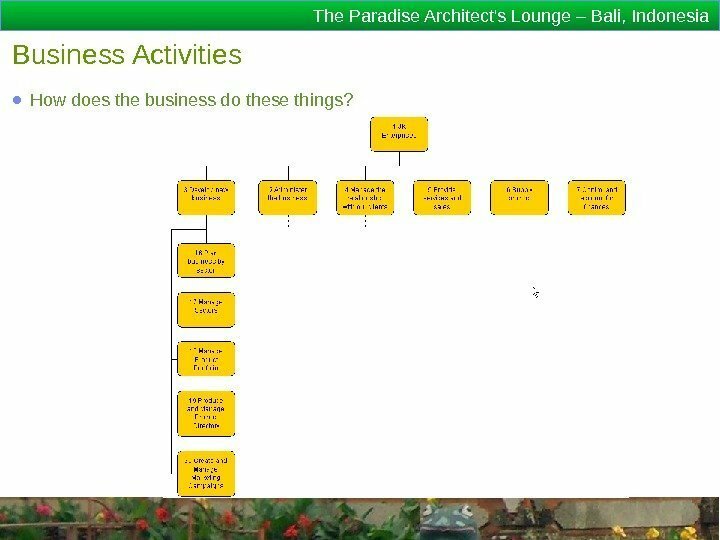 The Paradise Architect’s Lounge – Bali, Indonesia Business Activities ● How does the business do these things? 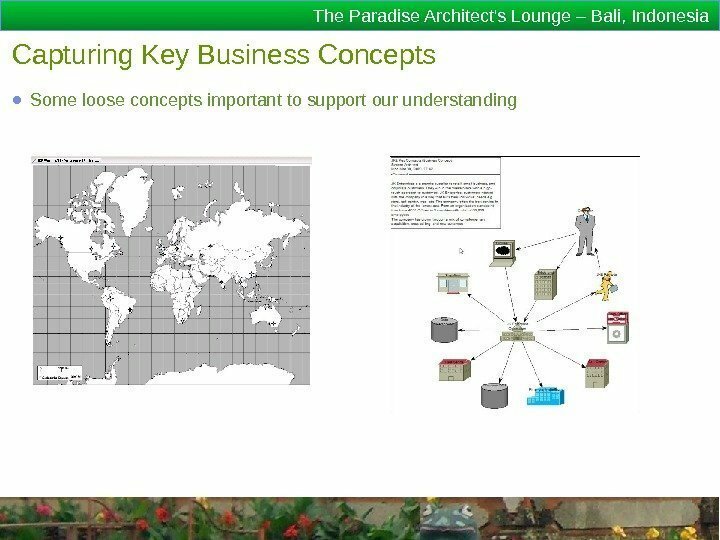 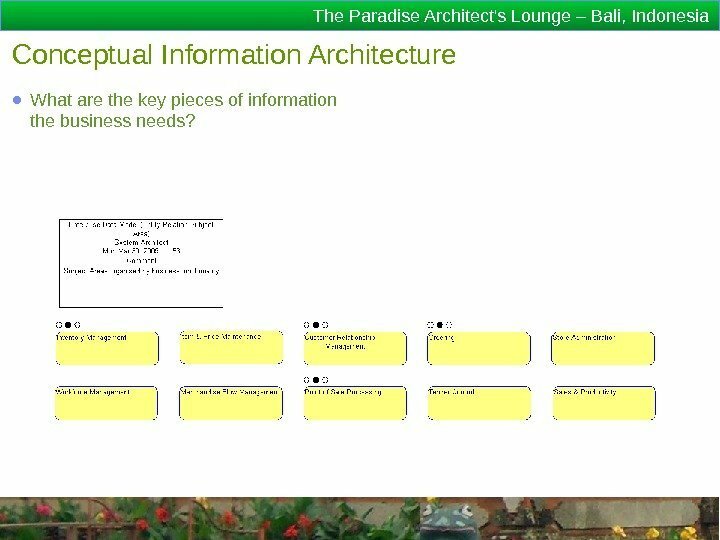 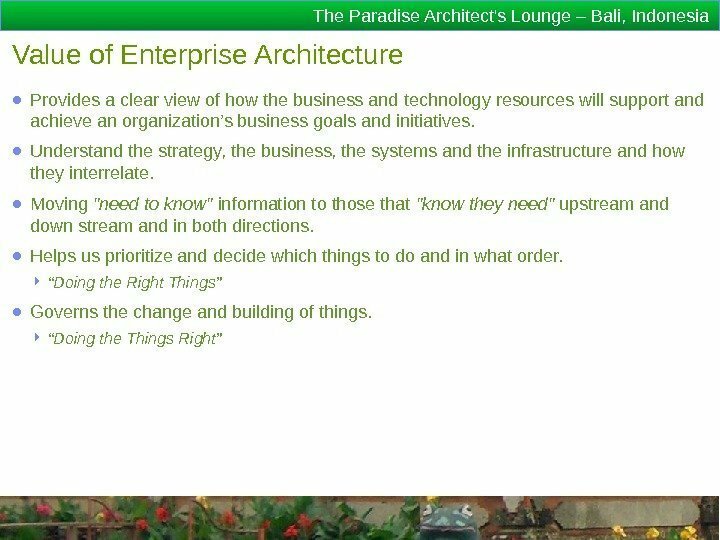 The Paradise Architect’s Lounge – Bali, Indonesia Conceptual Information Architecture ● What are the key pieces of information the business needs? 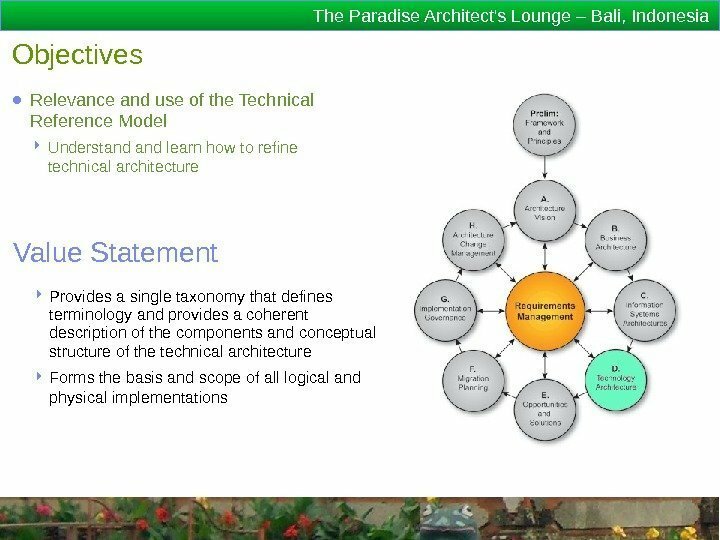 The Paradise Architect’s Lounge – Bali, Indonesia Conceptual Application Architecture ● What are the key functions our applications must provide? 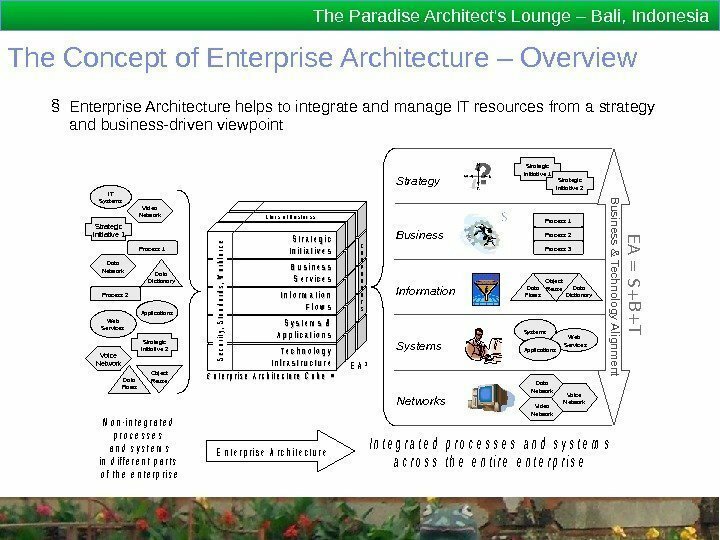 The Paradise Architect’s Lounge – Bali, Indonesia Conceptual Technology Architecture ● What are the key technologies our applications and business need? 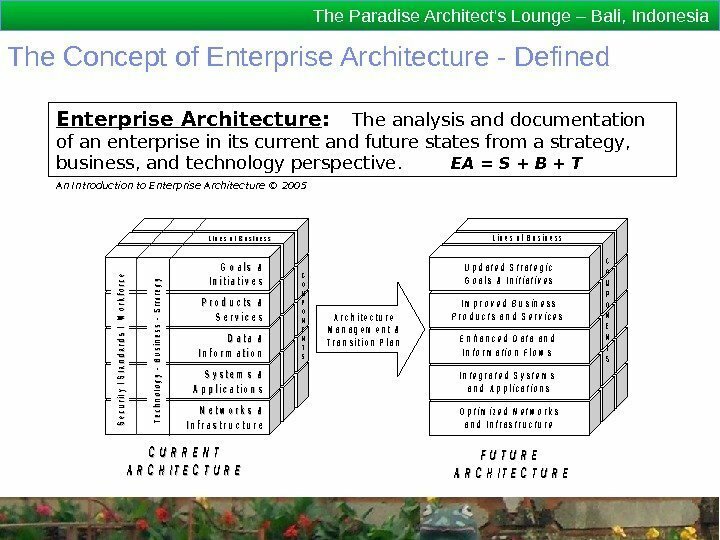 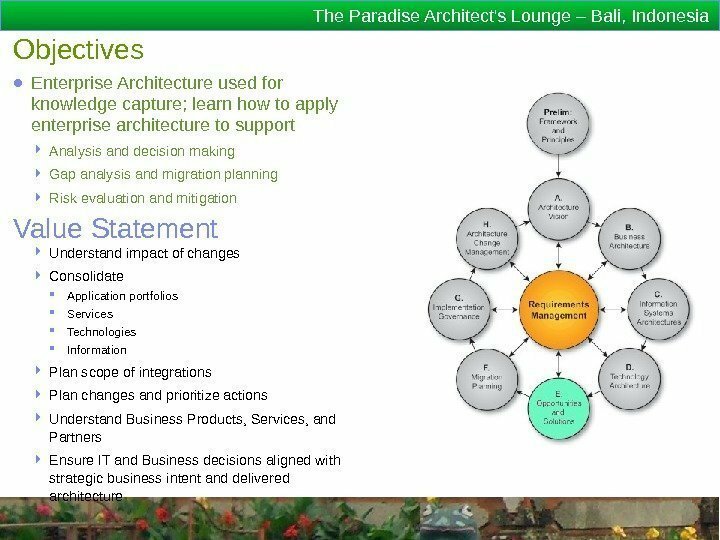 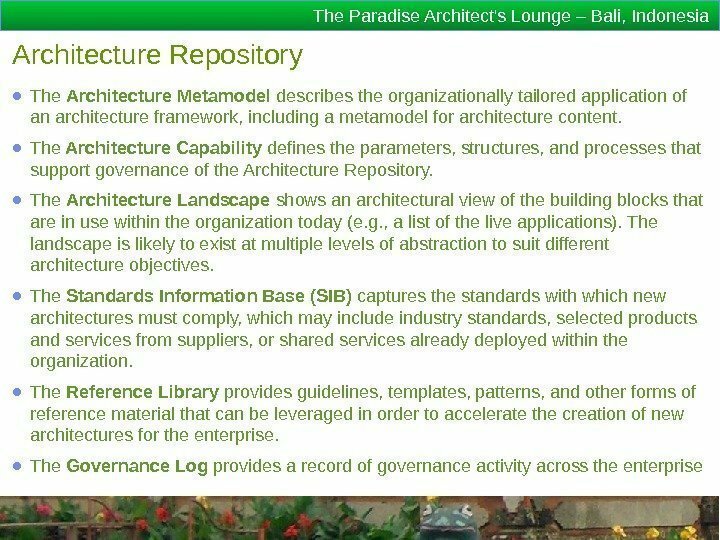 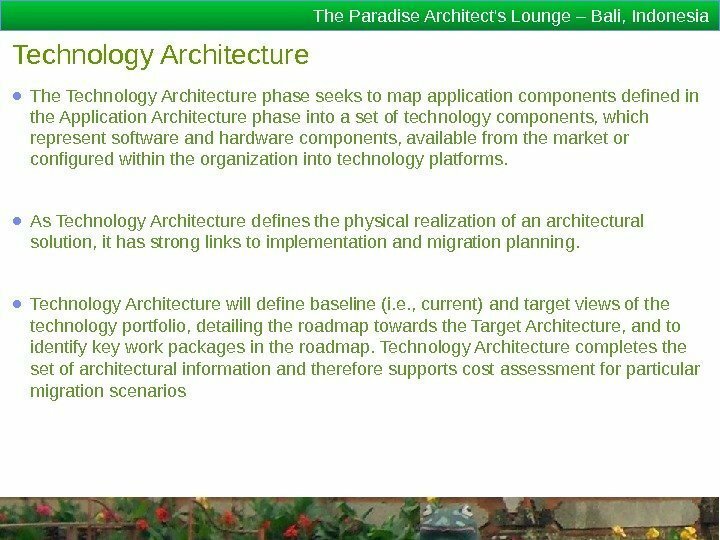 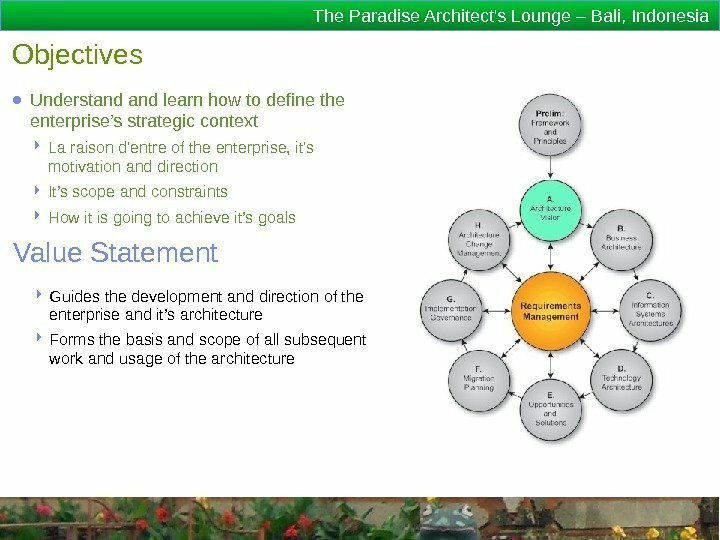 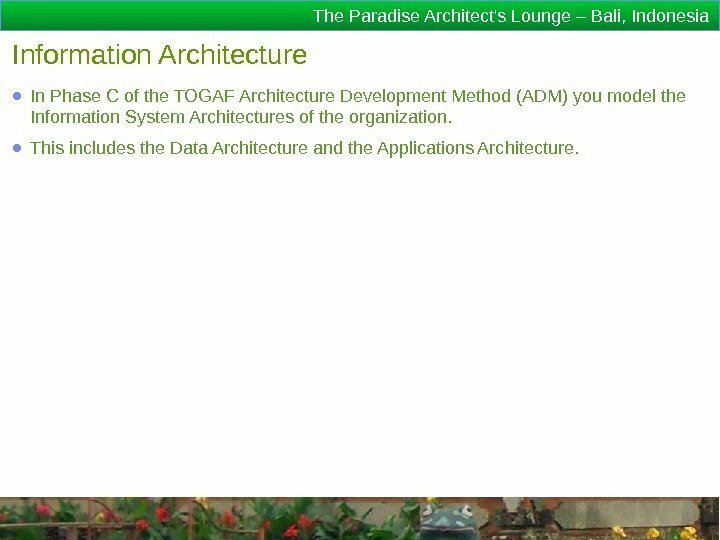 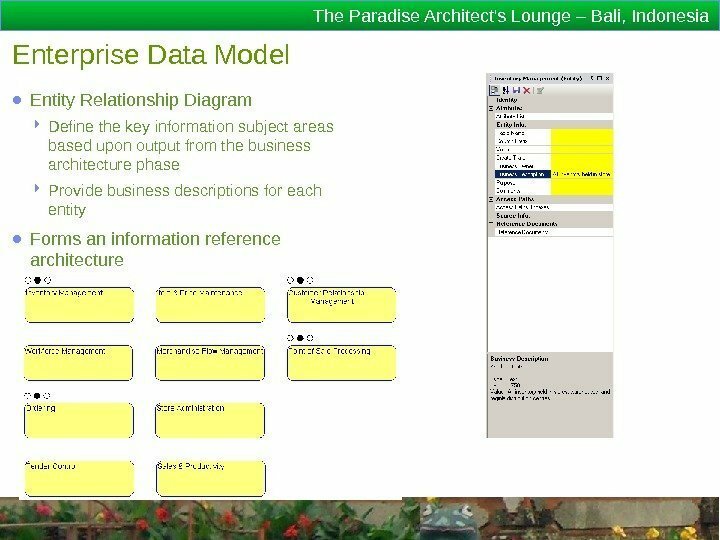 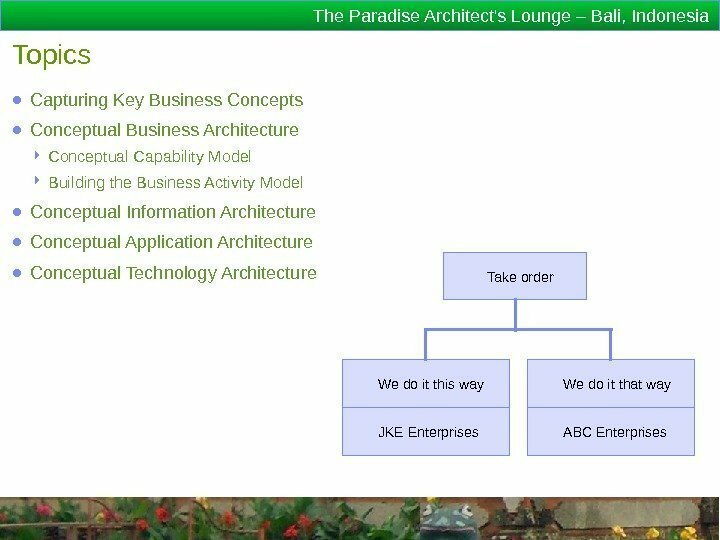 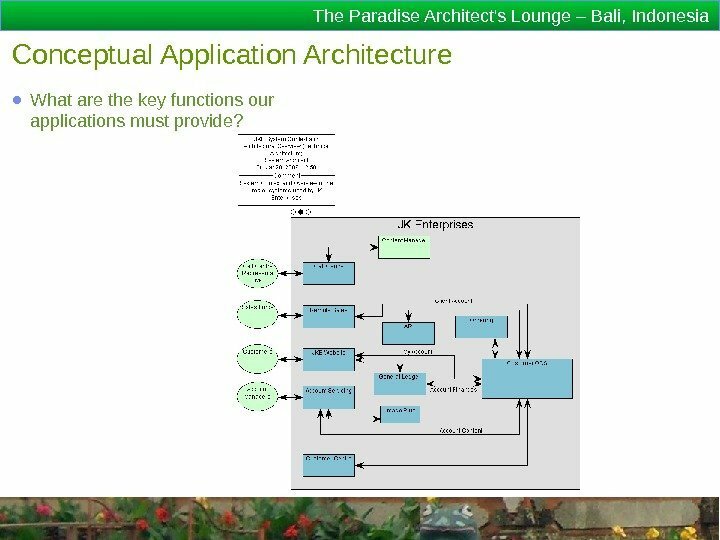 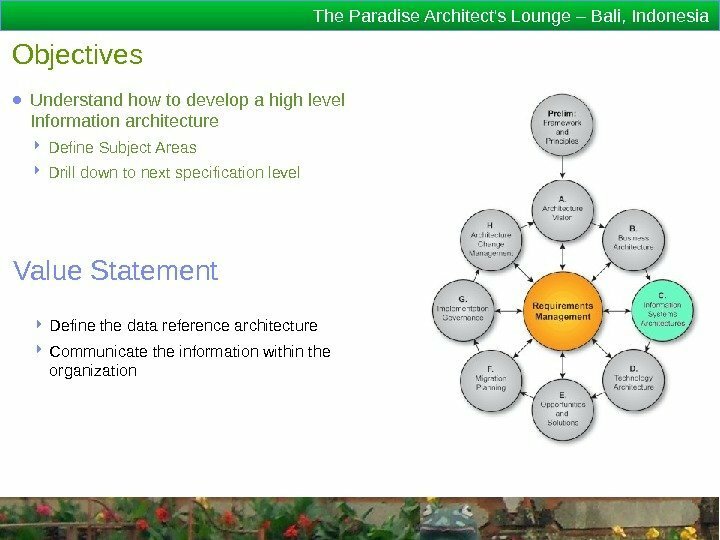 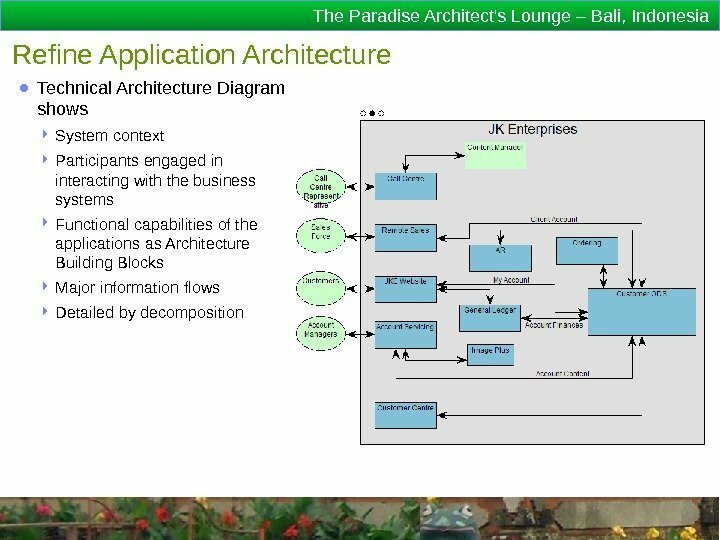 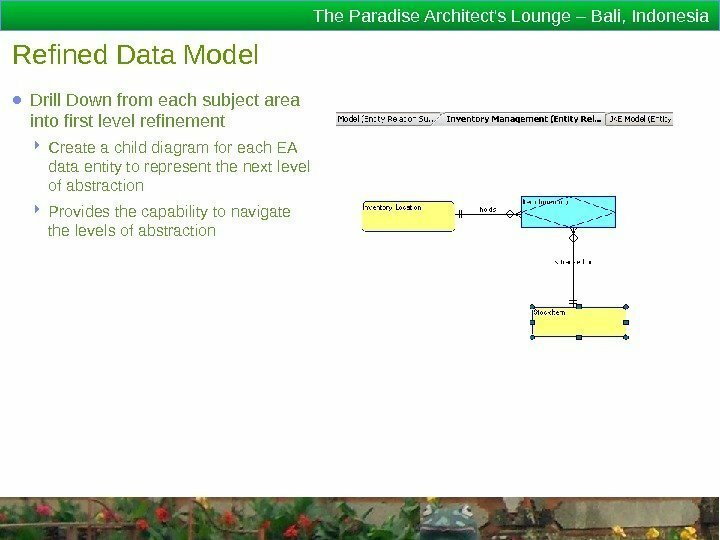 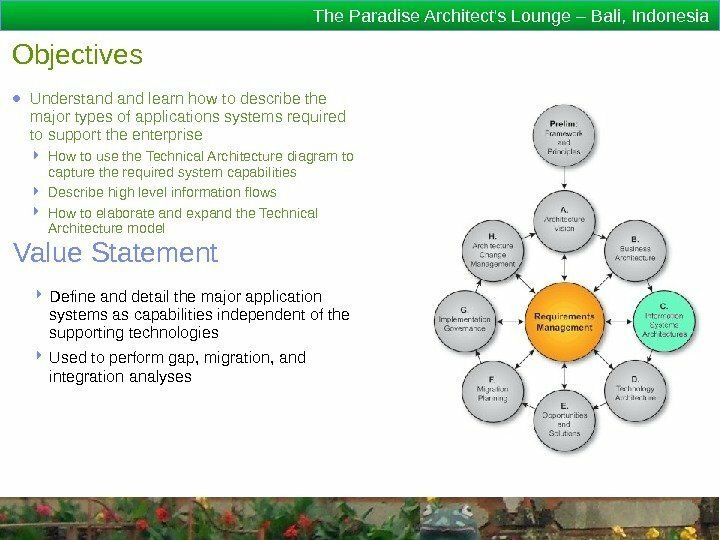 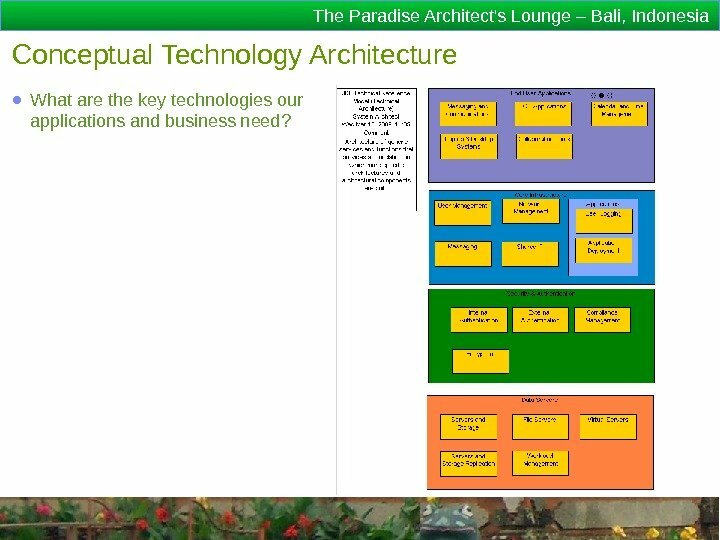 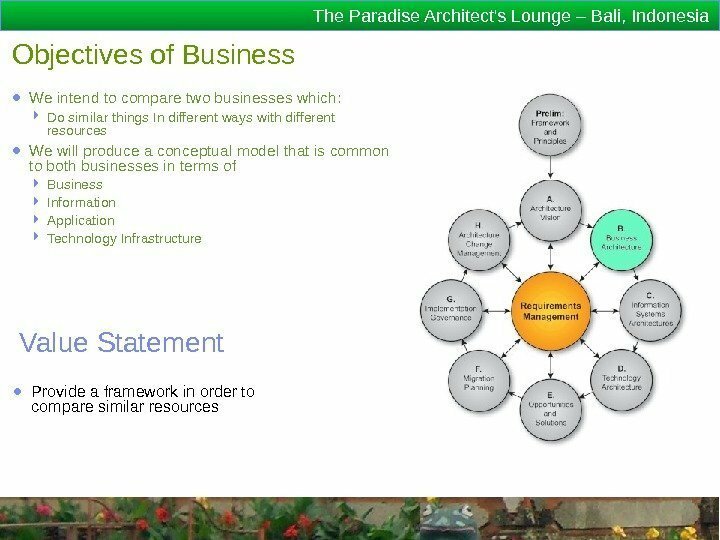 The Paradise Architect’s Lounge – Bali, Indonesia Information Architecture ● In Phase C of the TOGAF Architecture Development Method (ADM) you model the Information System Architectures of the organization. 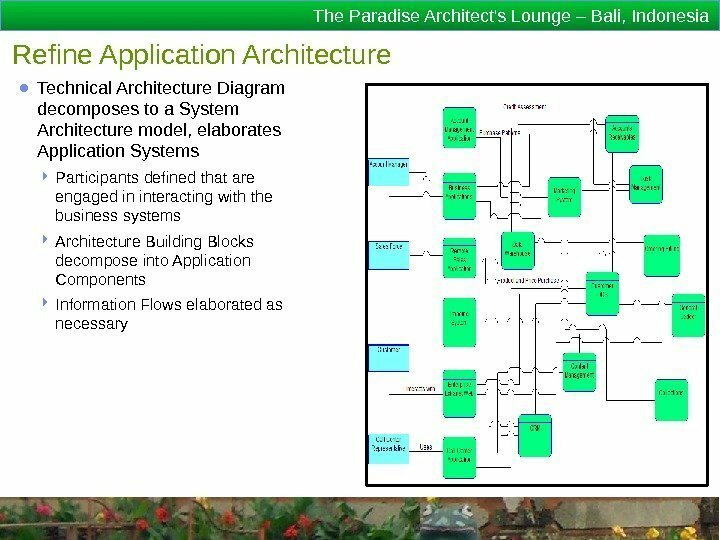 ● This includes the Data Architecture and the Applications Architecture.